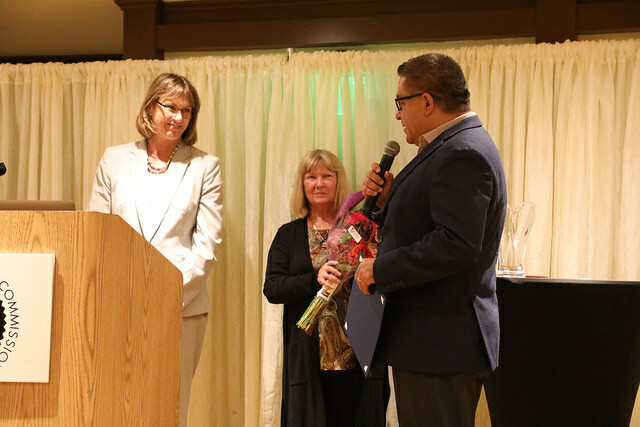 Santa Barbara County Agricultural Commissioner Cathy Fisher was named the 2018 Flower Farm Champion by the California Cut Flower Commission (CCFC) at its annual meeting Nov. 18 in Santa Barbara. She is the third recipient of the prestigious award. 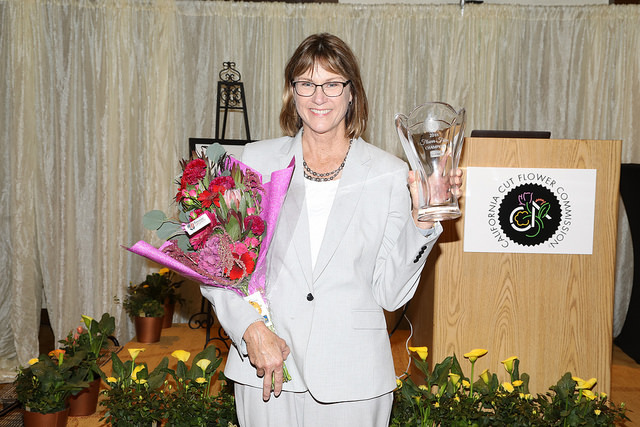 Cathy Fisher was honored as the 2018 Flower Farm Champion at CCFC’s Annual Dinner on November 8, 2018. Photo by Linda Blue Photography. 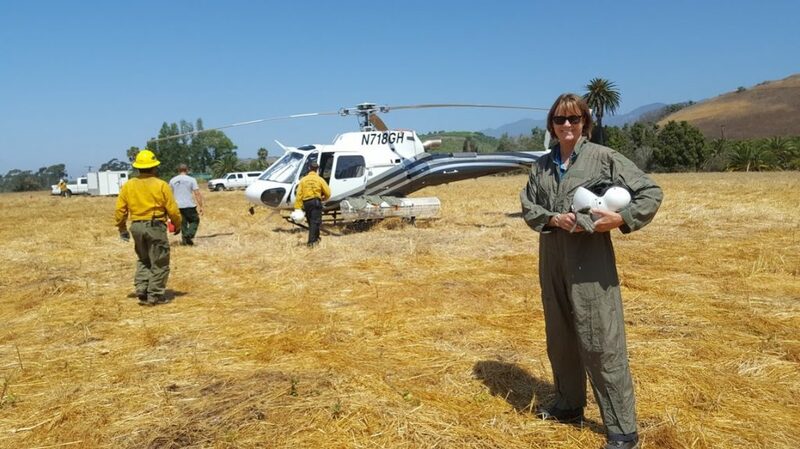 Fisher was recognized for not only her balanced and straightforward approach to regulating farms and collaborating with flower farmers, but also for her amazing efforts during last December’s Thomas Fire in Santa Barbara and Ventura counties. And flower farmers throughout the area (and statewide) are forever grateful for her efforts! Agricultural Commissioner Cathy Fisher believes in a hands-on approach. Here, Cathy is shown on site during the fires of 2016. Photo courtesy of Santa Barbara County Agricultural Commissioner’s Office. Fisher has served as Santa Barbara County ag commissioner for two terms, beginning in 2010. She began in the industry in 1988 as an agricultural biologist trainee with Contra Costa County Department of Agriculture. She was promoted to deputy agricultural commissioner in 1998, and was appointed chief deputy by the Contra Costa County Board of Supervisors in 2007. In 2017, the Flower Farm Champion award went to Crystal Hedgpeth, floral sales manager for Safeway’s Northern California Division. Hedgpeth earned the award for the creation of Safeway’s Blue Bucket Campaign that showcases California Grown Flowers in the company’s 280 Northern California stores. In 2016, the recipient was Lois Capps, former U.S. Representative for California’s 24th congressional district, for her notable efforts to support California’s flower farmers. A founding member of the Congressional Cut Flower Caucus, Capps served as a co-chair of the caucus since its inception in 2014. She also helped drive awareness of issues impacting California’s flower farmers, certified CA Grown floats at the Tournament of Roses Parade and met with farmers during advocacy events in Washington, D.C.